In the Death List of a Day (New York Times, 21 June 1898, p.7): "George Focht, head of the George Focht Iron Works Company of Hoboken, died at his home, 102 Adams Street, Sunday night. He was born in Eisenach, Germany, March 13, 1823. He came to this country in 1849, and settled in Reading, Penn. While there he invented the Focht self-dumping coal tub. This made him wealthy, and he removed to Hoboken, intending to live in retirement; but he soon tired of inactivity and established the Focht Iron Works, now one of the largest establishments of its kind in New Jersey. His wife died in 1892. He is survived by two sons and three daughters." George Focht (1823-1898) obtained two patents for his self-dumping coal tub in 1857. The first, patent no. 17,034, dated 14 April 1857, contained this illustration of his invention. The second, illustrated here, dated 3 Nov. 1857, changed the dumping mechanism considerably. Specifically a lever used to release the bucket for dumping has been moved from the front of the bucket to the back. As Focht wrote in the later patent application, "Much inconvenience has been experienced by locking the handle at the front edge of the bucket, especially when coal or any substance in large lumps, is to be raised; I therefore use the catch lever locking to the back edge and thereby secure all the advantages of the other arrangement without its inconveniences." Schlegel writes, "George Vogt (Focht), third child and son of Daniel and Dorothea (Hebig) Vogt, was born at the family home in the city of Eisenach, in the principality of Eisenach, Grand Duchy of Saxe-Weimar, Germany, March 13, 1823... [He] was placed under the guidance and tuition of a master mechanic, and he was accordingly apprenticed to learn the locksmith trade... [He] .. pursued his trade ... up to 1849, in which year he decided to emigrate to the United States... and accordingly set sail for the harbor of Philadelphia, Pennsylvania, where he arrived August 8th, 1849. "The present buildings comprising the foundry department, along with the pattern making department and lofts in connection with the offices and drafting department of the establishment, now occupy the space of fourteen city lots... The George Focht's Sons Iron Works and Machine Shop have become an important enterprise in Hoboken... George Focht died at his home in the city of Hoboken, Hudson county, New Jersey, June 20, 1898." This advertisement for George Focht Sons Iron Works appeared in History of Hoboken, 1907, Hoboken, N. J.: Issued by the Hoboken Board of Trade, 1983. This advertisement for Geo. Focht Sons appeared in the New York Central Railroad's Industrial Directory and Shippers' Guide, 1921. Their address was still 105-123 Adams Street. The Focht foundry in Hoboken was continued under his sons, George Focht, Jr. (1856-d. bet 1920 & 1925) and Charles H. Focht (1862-1935). Charles H. Focht's obituary notice in the New York Times, 7 Feb. 1935, with the dateline Palisades, N. J., Feb. 6, read, "Charles H. Focht of 96 Bluff Road, president of George Focht & Sons, iron manufacturers, of Hoboken, died this morning in the Englewood Hospital of cirrhosis of the liver, after a ten-day illness, at the age of 72. Since 1907 he had been president of the Jefferson Trust Company of Hoboken. There survive a widow, Annette Tasto Focht; two sons, Edgar and George, and three daughters, Mrs. Nettie Schmidt, Mrs. Emily Weisenborn and Mrs. Edna Moser." In 1942 two of George Focht's grandsons registered for the World War II draft. These were George Aloyius Focht (born 25 June 1881), the son of George Focht Jr., and George Lewis Focht (born 7 May 1890), son of Charles H. Focht. George Aloyius Focht lived at 117 Adams St., Hoboken, and was unemployed. George Lewis Focht lived in Union City, New Jersey, and was employed by the American Can Co. in New York City. According to Corporations of New Jersey at the New Jersey State Library, Geo. Focht Sons Iron Works, 119 Adams St., Hoboken, were incorporated 15 May 1905. 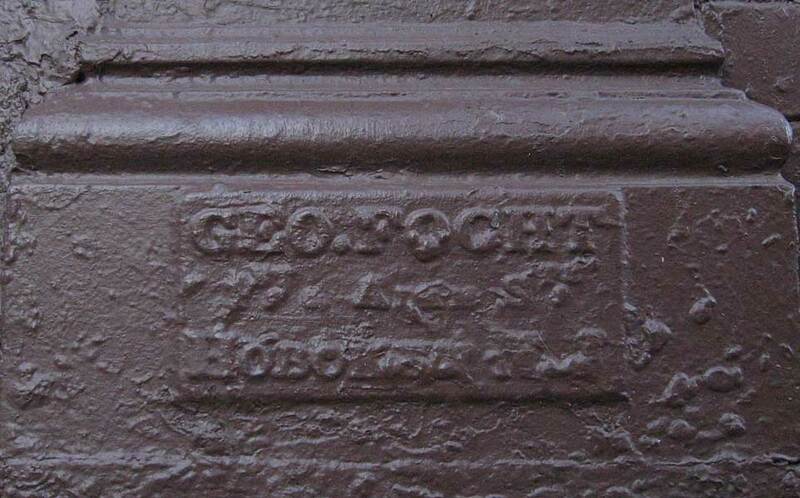 Hoboken, New Jersey, is home to several surviving instances of Focht cast iron including this foundry mark at 497 Newark St. reading "Geo. Focht Founders Hoboken N J." There is also a Geo. Focht Sons coal chute cover on Washington St. reading "Geo Focht Sons First & Adams Sts. Hoboken N.J.."